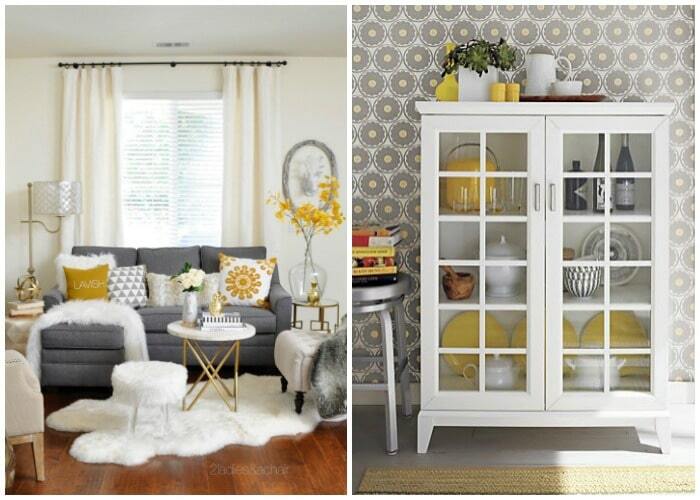 Decorating With Yellow and Gray – 20 Spaces We Love! 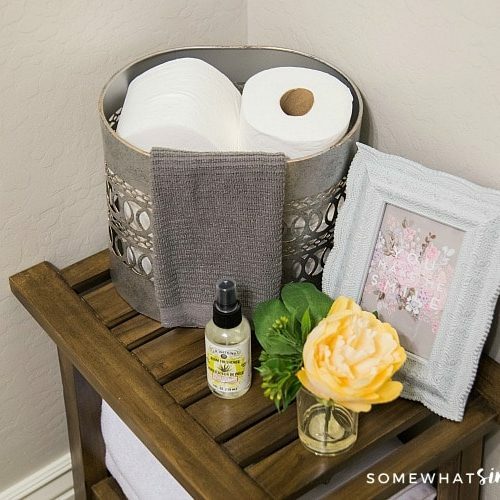 I thrive on changing up the decor in my house, so I do it as often as I can! Whether it’s rearranging furniture, moving around accessories, adding color… you get the picture. 1. 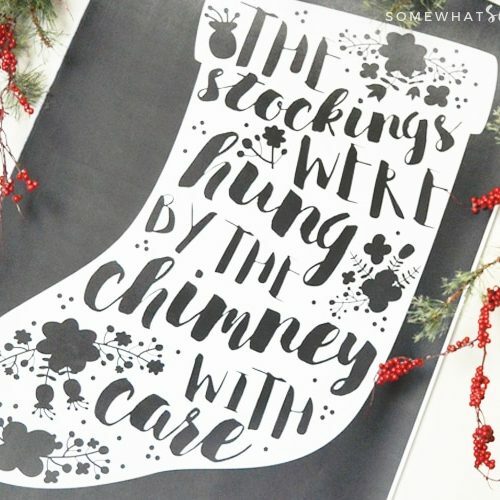 Starting off our list is a project that was linked to our link party YEARS ago, and it is still one of my favorites! This yellow and gray wall art from Blooming Homestead is so simple, but so pretty! 2. 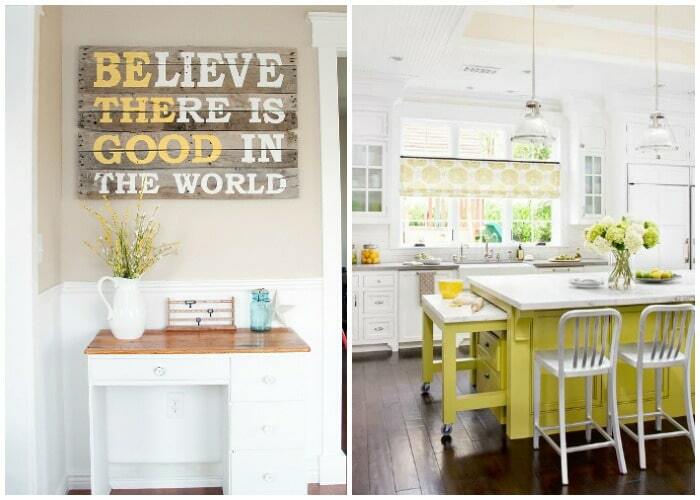 Add a little color to your kitchen by painting your island yellow, as seen on BHG. 3. Isn’t this boy’s bedroom amazing?? 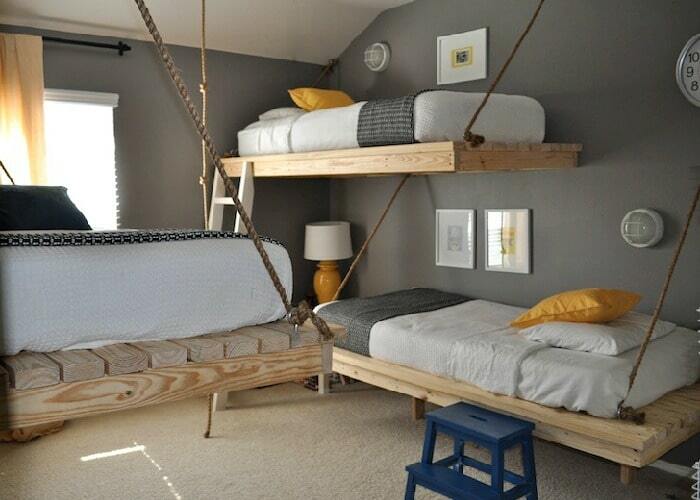 What little guy wouldn’t love one of these darling bunk beds??? From The Bumper Crop. 4. I absolutely LOVE the colors and shade of this yellow and gray exterior! From Home and Heart Magazine. 5. 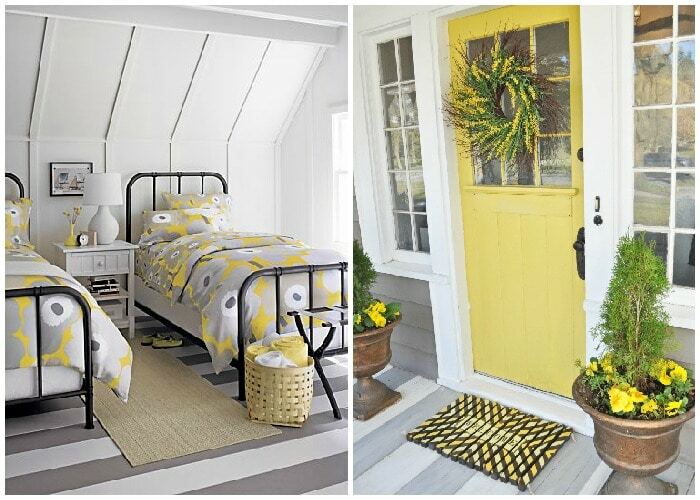 A brighter yellow makes Jen’s 1905 Cottage absolutely darling! From Tatertot’s and Jello. 6. This gray and yellow living room is contemporary and cozy, all wrapped up in one! From Decor Pad. 7. 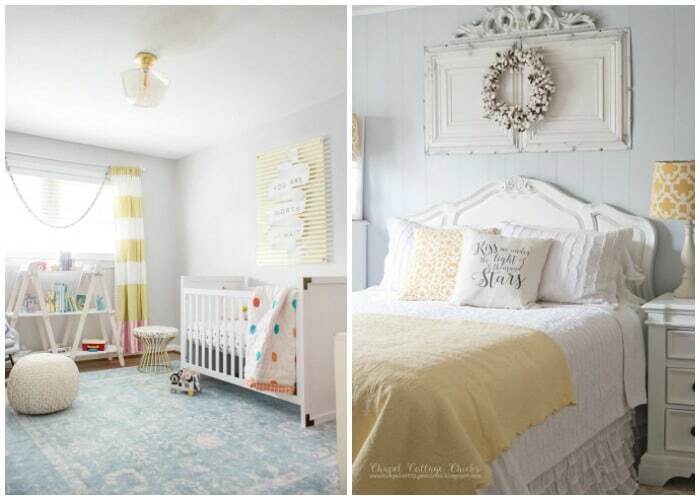 This darling unisex nursery is perfectly sweet, from Lay Baby Lay. 8. 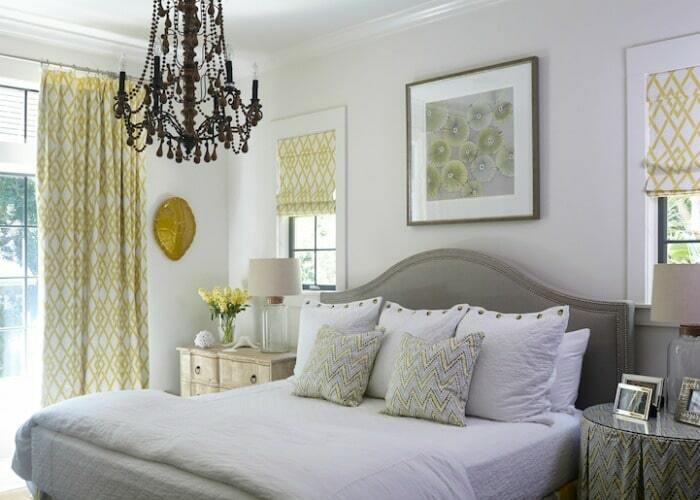 I LOVE this gray and yellow bedroom refresh, from Chapel Cottage Chicks. It looks so inviting! 10. 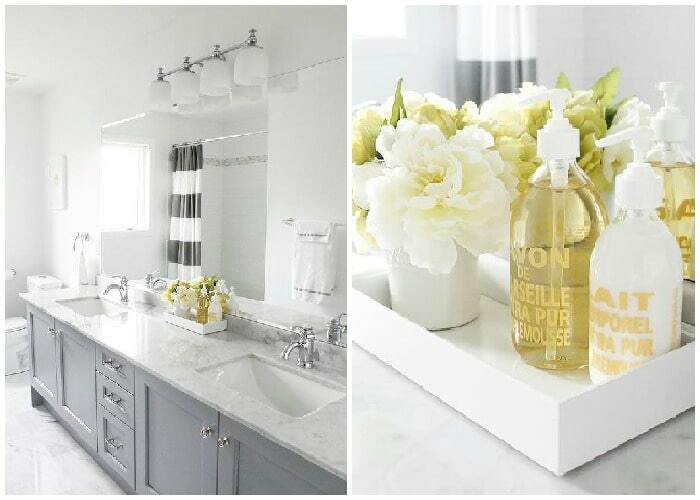 This yellow and gray bathroom might be my favorite space on this entire list! Michelle from AM Dolce Vita has amazing taste! 11. This girls shared bedroom has the cutest gray and yellow bedding! Don’t you think? From Pottery Barn Kids. 12. 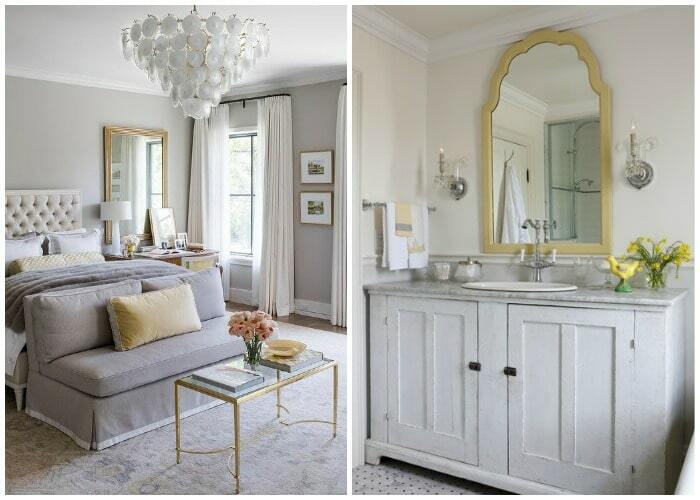 I wish my master bedroom had space for a gray french settee at the foot of my bed. From Jan Jones on Decor Pad. 13. Proof that there is such a thing as an elegant farmhouse bathroom! From HGTV. 14. This little boys bedroom features yellow accents that make it absolutely darling! (I LOVE that rug!) From BHDM Designs on Decor Pad. 15. I love all the different lines and textures in this gray and yellow living room, from 2 Ladies and a Chair. 16. I think the yellow and gray combo make the best kitchen accents. Isn’t this china hutch from Crate and Barrel perfect? 17. I picture afternoon chats with great friends in this cozy fresh living room, from Style at Home. 18. This dining room looks so warm and friendly, and I LOVE the table! From Decor Pad. 19. This farmhouse style bedroom is so bright and cheery, what a perfect way to start your day! From Crate & Barrel. 20. 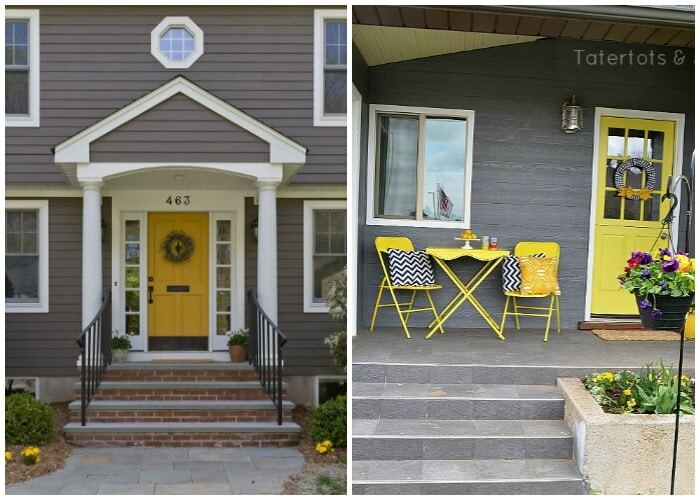 Last, but not least – this yellow and gray front porch is beautiful! From Creatively Living. 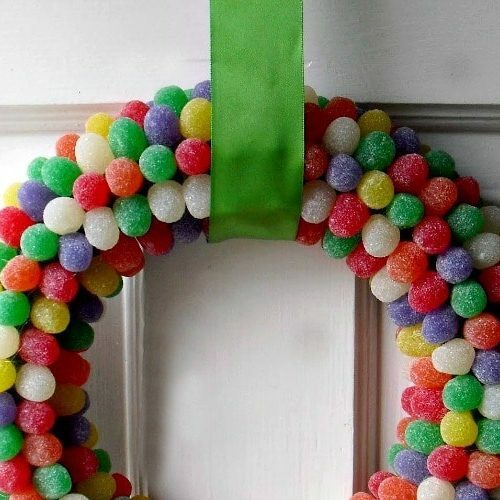 What are your favorite color combos for decorating? I’d love to hear and get some more ideas! This post originally published on Crazy Domestic in June of 2010. It was updated with some fresh ideas in 2018. I think yellow and gray look awesome together!!! I’m generally a “Blue” color lover, but we did remodel our Guest Bathroom and went with yellow and gray! Thanks for sharing all the wonderful photos! That farmhouse bathroom is INSANE! Oh my gosh, I could hang out in there all day! ;-). I do love the look f yellow and gray, but have a hard time introducing gray in my home because it seems to conflict with the beige carpet and tile I have throughout my home. I’m really smitten with teal lately, and am in the process of painting the media space in my basement in a deep, moody blue color (Aegean Teal), with accents in green and other shade of blue. It’s really a versatile color and I love that you can punch it up with orange, yellow – lots of options! I am loving yellow and gray. I want to redecorate my hall bathroom, but I am having trouble finding exactly what I imagine! My other favorite would have to be anything turquoise/robin’s egg blue/etc. but especially with red for a vintage feel. I’m getting ready to do one of our bathrooms in yellow and grey. My other favorite combo is black, brick red and yellow. I am new to loving yellow and gray. I think Sarah Richardson called it 'yellow and graphite'? She did an awesome yellow and graphite bath in her recent show on HGTV. When I got married way back in 92 I wanted a yellow and grey floral for the bride's maids dresses…could I find it? No. 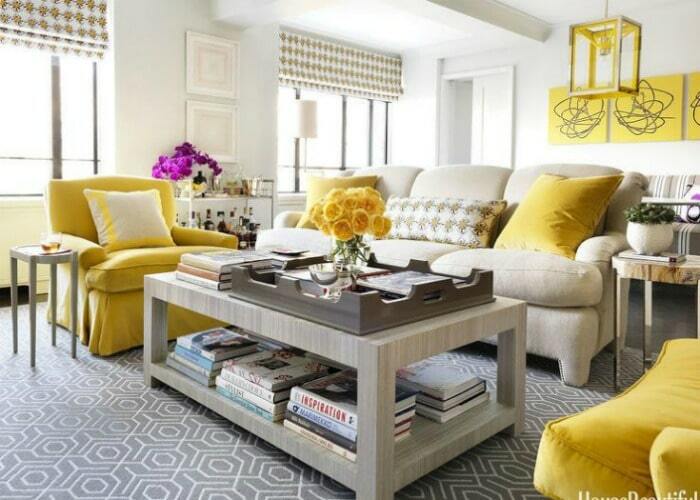 Oh my gosh, I LOVE yellow and gray. I also love raspberry and gray. But there's not a lot of places you want a ton of raspberry colored paint. (we talked my mom into doing her craft room gray with one raspberry wall. I covet it!!) I kind of also have a love affair with teal. I'm so glad you showed that kitchen. We're considering painting our kitchen cabinets when we put in a wood floor. I wanted some a gray color, but couldn't picture if it would look good on dark hardwood. And now I know…it does!! Yay! We are renovating our new home & did our kitchen in yellow with red accents. We love it! 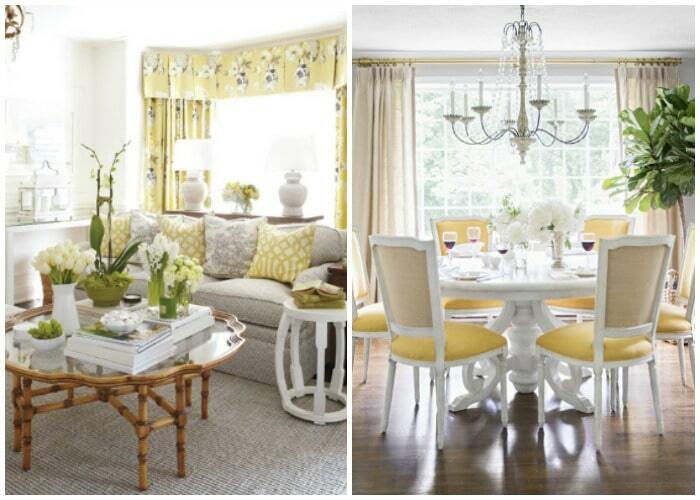 i also love yellow and gray and white! i am not much of a yellow person in general, so i am in the process of redoing my bedroom in gray and white andwill change out the accent color when i feel like it! right now it's gray, white, and blue, and i love the soothing and sohphisticated feeling! 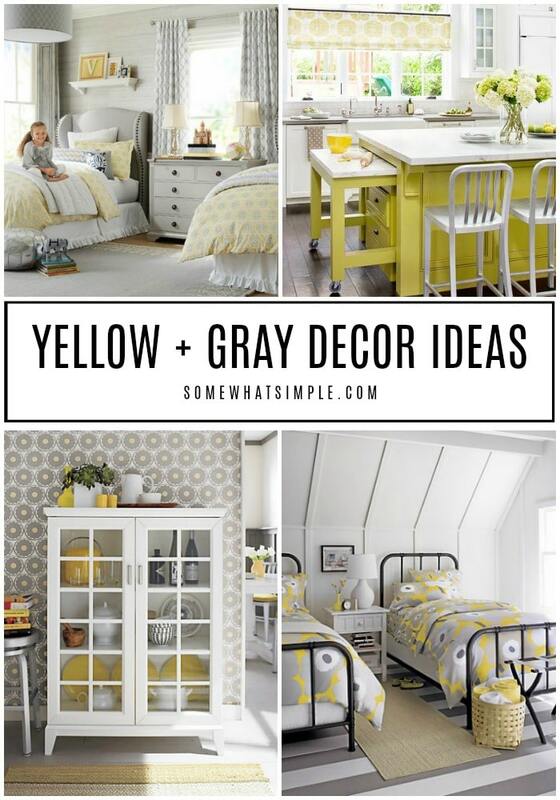 I have to say I LOVE yellow & gray! I saw it last spring (2009) on a card someone made & last summer we painted my house gray with yellow trim (I'm impulsive, yes, but in my defense the house DID need to be painted). I love love love the color combo! Thanks for all the pretty pictures!